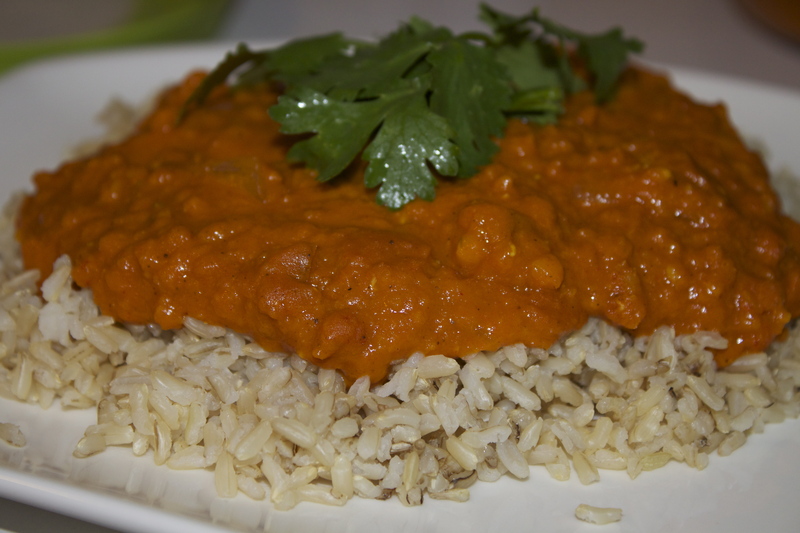 My recipes with lentils improve day by day. I like to eat it, when it’s being cooked the right way, looks good and tastes delicious. The benefits of lentils never end. This is one of the best plant based protein source, and to my surprise my daughter loves it. Unfortunately, when I made this dish, she couldn’t try it, because it was too spicy. Next time, I just need to change it a little bit, to let her enjoy this delicious dish with us. I already said that I like to make something very easy, but at the same time the food should be healthy, delicious and takes the least time to make. This recipe has it all, and its leftovers are even better than fresh cooked one. Don’t forget about the best combination for lentil: rice. You definitely need to eat your lentil with grains. Pairing two incomplete protein foods together, such as lentils and whole grain rice, will form a complete protein. This is important if you happen to be a vegan or strict vegetarian. Even if you were to eat lentils and brown rice at different times of day, they still help build protein in the body. The key is to consume them within a 24-hour time frame. I served it with brown rice, but you can use any kind of rice. Cook the lentils according to directions. Drain and set aside. Pour the oil in a large saucepan over medium high heat. Add the onion and saute for a few minutes until fragrant and golden. Add all the spices (curry paste, garam masala, curry powder, turmeric, cayenne, sugar, garlic, ginger) and stir fry for 1-2 minutes. Add the tomato sauce; stir and simmer until smooth. Add the lentils and the cream. Stir to combine and simmer for another 15-20 minutes (the longer, the better)! Serve over rice and garnish with cilantro. Recently I am trying to have soup every day for lunch ( plant based), because I feel better if I eat it, my family likes it and every time I am looking for a new great recipe to try. Because we don’t eat a lot of animal protein products, I always cook something with the other kind of protein to provide all the vitamins and minerals to us. One of the best source of plant based protein is lentil. It has around 15g of protein per serving. But it needs to be cooked with the right recipe. I tried to make it different ways before but it didn’t taste good all the time. So today I am going to share with you the super tasty coconut lentil soup recipe( my daughter’s favorite soup). To tell you the truth she can eat it three times a day for breakfast, lunch and dinner. It tastes delicious and very easy to make. 1. Toast the cumin and coriander in dry pot on medium-high heat for 2 minutes until you smell the aromas. Add a little vegetable stock, onion and pepper. Stir consistently until the onions is golden. Add the rest of the ingredients except lemon zest, lemon juice and chopped cilantro. 2. Put on a low heat, stir well and cover. Allow to cook for about 25-30 minutes, stirring occasionally, until the lentils have melted, meaning they have lost their round shape and have softened. 3. When soup is done, add the lemon zest, lemon juice and chopped cilantro. 4. Remove from the heat and serve with avocado. ( I don’t usually use cilantro and avocado and it still tastes good). This soup will work great in the fall for any kind of dinner as an appetizer or even can be served for Thanksgiving table.